As you drive along 91st Street, past Anne M. Jeans Elementary School and Burr Ridge Middle School, you may not realize that Burr Ridge Community Consolidated School District #180 is just over a 100 years old. A portion of what is now part of Burr Ridge #180 was known for a time as Byrneville, Illinois in deference to the Byrneville Railroad station. (History of Palisades Community Consolidated School District). The station was an important commercial site for the area’s dairy farmers who relied on the train to transport their goods to markets such as Chicago. Byrneville had little to offer residents other than being a train stop. Without a school, children from Byrneville had to walk three miles to attend Cass School. William Jeans, Professor John Doolin of Lemont, Mr. F.C. Tiedt, and Mr. William Wachter resolved to build a school for the community. In 1910, the Byrneville one-room school house was built. The structure remained in use until 1994 when the Burr Ridge Middle School was rebuilt. For many years, the Byrneville School’s only teacher was Anne M. Jeans. Ms. Jeans was an extraordinary teacher who devoted her life to education. She taught all of the elementary grades and handled all of the school’s janitorial work. Former students fondly remember her skill as a teacher. 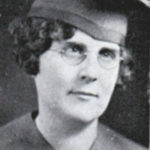 She provided students with extra curricular activities, scheduled field trips to Springfield, Illinois, directed school plays and held recitals as fundraisers. One student recalls that Ms. Jeans would bring a soup bone to school for the upper class girls to prepare for the school lunch. Read Burr Ridge School District Celebrates Its 100th Birthday for more memories of Anne M. Jeans. Ms. Jeans changed the school’s name from Bryneville to Palisades–to better reflect the area’s hilly terrain. As the area’s population increased, the district made additions to the one-room schoolhouse. In 1947, Ms. Jeans retired from teaching, but continued working as the principal for Palisades School. After 42 years of service, Ms. Jeans retired in 1958. The district showed their heartfelt appreciation by holding a community-wide retirement party for her. This remarkable teacher’s legacy still remains a part of Burr Ridge C.C.S.D. 180. In 1979, the district renamed Palisades West School in honor of Anne M. Jeans. Ms. Jeans died at the age of 95 in 1988.